During the end of the summer Andy and I were walking along Wickenden Street to go get some records. On our way to the record store, I noticed that the little house that used to be an Italian restaurant but has been vacated for quite some time, was undergoing a transformation. There was a small sign, in the menu placard on the outside, that said "The Blue Elephant- coming soon!" With a picture of, well, a blue elephant. I was curious about the restaurant, and decided to keep it in the back of my mind so I could ask around about it and the opening. But, like so many things that get pushed to the back of my mind, at some point I forgot all about The Blue Elephant, and it wasn't until a coworker mentioned she went there during the grand-opening week that I remembered walking by it this summer. Andy and I decided to check it out for our Sunday Brunch last weekend, because we are always looking for good, inexpensive breakfast/lunch places. The place is adorable on the inside. It is very homey, and broken up into smaller, intimate dining rooms. It is bright and cheery, and the walls in one room are adorned with hand-made jewelery for sale, while another features photographs by a local artist. 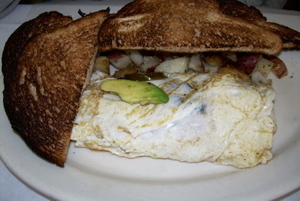 The omelette was filled with chili, black beans, jalapenos, and topped with slices of avocado. I didn't try the omelette, but since this is a new place, I wanted Andy to give his own review. So, in Andy's words, this is how the Rivera omelette was: "Overall, I thought the omelette was good, pretty basic but solid. I was kind of expecting something a bit more extravagant flavor-wise, because that's what going out to eat has led me to expect a lot of the time, but Blue Elephant just doesn't seem to be that kind of place. It's more straightforward. If you order sausage, red peppers, onion and american cheese in an omelette, that's what you get." The french toast was disappointing. I was encouraged at first by the nice browned sides, but the skillet must have been too hot because the inside was very, very mushy. I also think the soft texture could be the fault of too much batter- the taste of buttermilk was so strong that each bite was overwhelmingly sour. 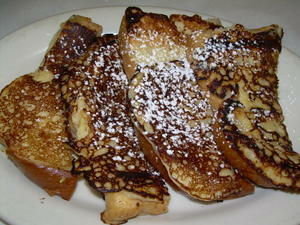 The thickness of the challah toast was perfect though, and that is sometimes a big gripe I have with french toast. Despite the french toast setback (something that is an easy fix), I do like The Blue Elephant. It was only the second week they were open, and I think restaurants deserve a grace period to work out the kinks and establish their cooks, dishes, etc. We had a fantastic waitress also who comped our drinks (an orange juice and a latte) because we waited awhile for them to arrive- but it was a wait we barely even noticed. I'm going to give the restaurant a couple more weeks, and I look forward to trying it again. I signed up for their email list so that I can receive their dinner menu which changes weekly, and it looks very promising (Maple-Mustard Chicken and Lavender and Basil Scallops)!